This SLLIMM (small low-loss intelligent molded module) nano provides a compact, high performance AC motor drive in a simple, rugged design. It is composed of six MOSFETs and three half-bridge HVICs for gate driving, providing low electromagnetic interference (EMI) characteristics with optimized switching speed. The package is optimized for thermal performance and compactness in built-in motor applications, or other low power applications where assembly space is limited. 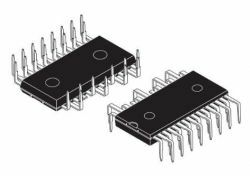 This IPM includes an operational amplifier, completely uncommitted, and a comparator that can be used to design a fast and efficient protection circuit. SLLIMM™ is a trademark of STMicroelectronics.